Swimming pools aren’t the only places where kids can immerse themselves this summer. A couple of theater pieces are offering a different kind of “immersive” fun. At Adventure Theatre MTC, the experience actually does involve water. For its production of Jumanji, a mist periodically drizzles over the audience, along with bubbles and cardboard bits doubling as snow or lava. Oversize puppets, also made of cardboard, loom near the seats, and projections and lighting effects seem just as close. Adventure Theatre Artistic Director Michael J. Bobbitt, who adapted the classic 1981 picture book by Chris Van Allsburg with Sandra Eskin, said he used his technical “toys” to make the show a “4-D” experience. “I’ve gotten into this idea of immersive theater and how much more visceral it can be,” he says. Thus came the rain, the bubbles, the snow, the lava. But first, he and Eskin had to fill in the story. In the book, a brother and sister discover a magical board game that transports jungle animals into their home. Even with Van Allsburg’s drawings, it’s a little book. When Peter (Ryan Carlo) and his big sister, Judy (Billie Krishawn), start to play Jumanji, a huge snake puppet twists and glides into their living room. (Kids who know the book will see that the order of animals is different; in the book, the lion comes first.) The puppets — monkeys, lion, birds and more — were designed by Andrea “Dre” Moore and are visibly operated by actors. Elan Zafir, who plays the hopelessly incompetent jungle guide, says kids “just go ape over some of the things that happen.” His role, quite small in the book, becomes key here, helping to tone down the scary and amp up the humorous. “I wanted to make sure the show was really funny and surprising, but not scary,” Bobbitt says. So the guide may look like a steely eyed Indiana Jones-type hero at first, but he turns out to be comically inept — a poser. “He’s seen too many movies. He’s read too many books,” Zafir says. “He’s kind of vain . . . he thinks he’s this dashing, romantic, swashbuckling adventurer . . . but he’s flawed.” The guide’s ineptitude, Bobbitt says, forces Judy and Peter to figure out how to solve the problem on their own. Seeking ways to make his character non-threatening and funny, Zafir says he improvised a lot in rehearsals and even preview performances. In live theater, he says, the relationship between actors and children is like a secret pact. “Jumanji” through Aug. 28 at Adventure Theatre MTC, 7300 MacArthur Blvd., Glen Echo, Md. 301-634-2270. adventuretheatre-mtc.org . $19.50. That was the sentiment summed up by a young theatergoer sitting behind me at Adventure Theatre MTC’s recent adventurous production ofJumanji. Based on the Caldecott Medal winning book by Chris Van Allsburg, the show tells the story of two kids left home alone in their new house and discover a board game that comes to life as they roll the dice. The 1981 book was famously turned into a 1995 movie starring Robin Williams, but the plot of the play is closer to the original book than the movie, although the premise is the same. Adapted for the stage by Sandra Eskin and ATMTC Artistic Director Michael Bobbitt, it is an adventure for both the audience and the team behind the onstage magic. The show, which clocks in just shy of an hour, kept the children in the audience at the seat of the pants in large part due to the impressive puppets by Andrea “Dre” Moore. Ms. Moore always seems to outdo herself with each production she designs and these animals come to life with her creative magic. The sprawling set by Luciana Stecconi is perfect in the intimate space. Jungle master and director, Serge Seiden, uses the space so well and puts Ms. Moore’s puppets to use through his almost ballet-like direction of bringing these animals to life. The main cast, the children, played by Ryan Carlo and Billie Krishawn, are great as the fighting siblings who come together to win the game, and bring great personalities to the roles. The “adult” cast, who also are the puppeteers, are played with gusto by Julia Klavans, Jacob Yeh, and Elan Zafir. As their characters they each bring a certain charm to their adult counterparts, but their true mastery is in their puppeteering, and giving these animals personalities. 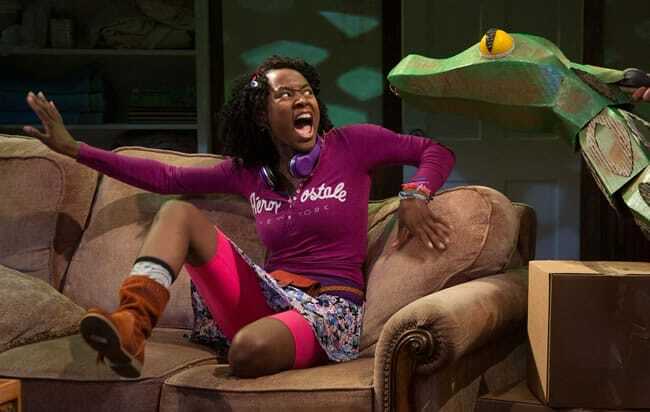 Billie Krishawn as Judy, Ryan Carlo as Peter, and Elan Zafir as The Guide in Jumanji at Adventure Theatre/MTC . Photo by Michael Horan. Adventure roars in Jumanji! 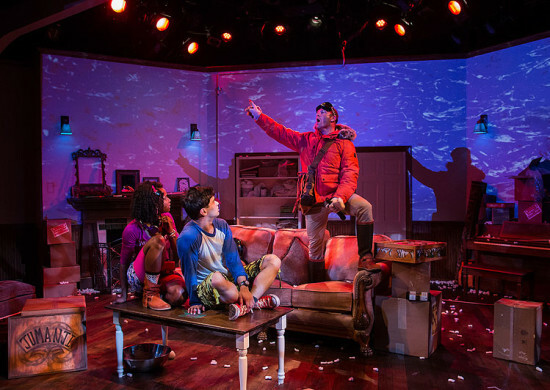 Directed by Serge Seiden, based on the 1982 Caldecott Medal winning book by Chris Van Allsbur and adapted by Sandra Eskin and Adventure Theatre, MTC’s own Michael Bobbitt, Jumanji stampedes its way to Adventure Theatre, MTC as the final production of their full 64th season. Adventure Theatre’s Jumanji follows closely to the original story about Peter and Judy, who find the mysterious board game in a closet, apparently left by the previous owners of their new house. Their parents are away for the evening, and when Peter finds the old board game and wants to play, Judy relents because of boredom. They find quickly that Jumanji is a jungle adventure contest that is far more real than a game. The first roll of the dice blur the line between reality and fantasy as the adventures in the game come to life and hilariously vex Peter and Judy. I don’t want to give away too many visits from the jungle, but let me say there are a lion, a snake, and a few monkeys, who are both very cute and very mischievous. With help from a jungle guide, Peter and Judy realize they must finish the game to get everything back to normal before their parents arrive home. This production is completely absorbing. It entices the audience into all of the adventures – a complete “4-D jungle experience” as stated by Adventure Theatre. There are fabulous puppets (Andrea “Dre” Moore), eye-catching projections (Patrick Lord) and lighting (Andrew Griffin), gripping sound (Kenny Neal) and special effects (Andrew Berry) and a thrilling and wet monsoon. I’m trying to remember when I had so much fun at the theatre, and I’m having a hard time coming up with one. Billie Krishawn as Judy is great as a typical teen who has to watch her little brother, but she also shows fear and worry over her situation with ease. Ryan Carlo as Peter perfectly portrays a slightly spoiled pre-teen with too much energy and a lower than average instinct for self-preservation. And every time Elan Zafir, as the Guide, opens his mouth and says his lines, the audience laughs. It’s a given. He’s that good. We don’t see much of the parents, Julia Klavans as the Mom and Jacob Yeh as the Dad, but as puppeteers they do a great job bringing the numerous and various puppets to life. Jumanji is the 4th original production done by Adventure Theatre, MTC this season, and I know I have said this before, but cherish how lucky are we that we are able to see this caliber of theatre each and every year. Please don’t miss this one! Advisory: Recommended for ages 4 and up due to jungle suspense. Adventure Theatre MTC (ATMTC) finishes out its 2015-2016 Season with their fourth world premiere production, Jumanji. The adaptation was co-written by Sandra Eskin and ATMTC’s Artistic Director, Michael J. Bobbitt, and was based on Chris Van Allsburg’s book of the same name, which won the Caldecott Medal-a prize that goes to the artist of the most distinguished American picture book for children. 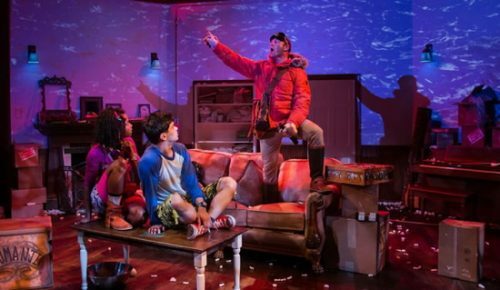 ATMTC has proven time and time again to be one of the top sources of Theatre for Young Audiences in the Maryland and DC area, and Jumanji is no exception. Serge Seiden, directs this beautiful production the theatre is calling a “4-D jungle experience,” which includes incredible puppets and effects that allow the audience to truly feel they are immersed in the story. The design team (Costume Designer Roberto Croghan, Set Designer Luciana Stecconi, Projections Designer Patrick Lord, Lighting Designer Andrew Griffin, Sound Designer Kenny Neal, and Props Designer Andrea “Dre” Moore) outdoes themselves with this show, creating the illusions of a stampede, a monsoon, an erupting volcano, and jungle animals on the loose, including a massive lion and meddlesome monkeys. The story starts with two siblings, Judy (Billie Krishawn) and Peter (Ryan Dalusung), who attempt to cure their boredom by playing an old, unfamiliar board game they have found. The two quickly discover that the game is all too real, when every roll of the dice brings another live-action encounter with wild animals and natural disasters taking over their home. The game soon turns up a jungle guide, played by the wildly energetic and hysterical Elan Zafir, and the kids realize that the only way to get through their adventure is to play the game to the very end. Zafir is also one of the puppeteers, along with Julia Klavans, and Jacob Yeh, who double as the Mom and Dad respectively. The cast does a fantastic job creating and maintaining the level of intensity required for this show to work. With the tremendous amount of effects, imagination and commitment are needed from the audience in order to make the show believable, and the entire cast and crew draws the audience in flawlessly and never loses their focus. ATMTC is marketing Jumanji as appropriate for ages 4 and up, due to some of the more suspenseful moments. Jumanji is action-packed and is a heart-pumping, visually-stimulating treat for the whole family! Do not miss out on the epic journey. Great Googly Moogly! Did you know there are monkeys loose in Glen Echo Park? Not only monkeys, but a giant snake, some rhinos, and some huge buzzy insecty things. It’s a veritable jungle inside Adventure Theatre MTC at Jumanji, with lots of delightful surprises in store for lucky youngsters (and some surprises for their parents, too)! For us oldtimers, the name Jumanji brings to mind the mid 1990s blockbuster film of the same name; this delightful hour long scaled-down version is based on the same book by Chris Van Allsburg, and remains faithful to the original story. Judy (Billie Krishawn), her parents and her younger brother Peter (Ryan Carlo) have recently moved to an old house, which is still stuffed full of moving boxes. The parents go out for the evening, leaving Judy to babysit, telling the kids to do some unpacking while they’re gone. True to kids everywhere, younger brother Peter immediately ignores the chores at hand and begins to explore the old house, a lovingly recreated Mission style set by designer Luciana Stecconi. In the closet he finds an old safari themed game- Jumanji, in which anything that happens in the game happens also in real life. And so: monkeys. Big snake. Chattering birds. Monsoons. You get the idea. For anyone young or old who’s ever pretended that the living room has suddenly filled with lava and you have to jump across the sofa to get across the room, the appeal is unmistakable. It’s why the book and movie continues to be such big hits with kids: of course the game is real- the grownups are out! Stuff like this would never happen if Mom and Dad were in the house! So why not just read the book or see the movie? One word: realism. Kids lucky enough to have grownups take them to Adventure Theatre/MTC will get to see crazy chattering monkeys up close and personal, a ginormous snake pop out of a closet, and (spoiler alert) really-truly rain from a monsoon, windy wind and bubbles of snow falling gently on their heads. Nope, you just don’t get that kind of in-your-face, cover-your-head-with-your-program stuff from a movie, folks. It’s immersive theatre with a great sense of humor attached. The special effects by designer Andrew Berry are crackerjack, and in this heat, pretty refreshing, too. Puppets by Andrea ‘Dre’ Moore are wonderful, stylized just enough so as not to be frightening to the younger set, and well manipulated by the three puppeteers (Julia Klavens, Jacob Yeh, and Elan Zafir) who also play Father, Mother, and the Guide. Elan Zafir is unfailingly hilarious as the Guide who can’t quite guide the siblings out of the mess they’ve created. To be fair, he has some of the best lines in the somewhat predictable script, but he makes the most of every entrance- and the rest of the cast is lively and enjoyable throughout the play, too. It’s a fun show– but don’t read this review to the kiddies before you go. Let’s us grownups have it be a secret between us that they’re going to see a play and then get rained on. Jumanji. Playwrights: Sandra Eskin, Michael J. Bobbit; based on the book by Chris Van Allsburg . Director: Serge Seiden . Assistant Director: Elena Day . Cast: Ryan Carlo as Peter; Billie Krishawn as Judy; Julia Klavans as Puppeteer #1/Mom; Jacob Yeh as Puppeteer #2/Dad; Elan Zafir as Puppeteer #3/Guide . Costume Designer: Robert Croghan . Scenic Design: Luciana Stecconi . Projections Designer: Patrick Lord . Lighting Design: Andrew Griffin . Sound Design: Kenny Neal . Special Effects: Andrew Berry . Properties & Puppet Designer: Andrea “Dre” Moore . Stage Manager: Donna Reinhold . Properties & Puppet Assistant: Amanda Strok . Produced by Adventure Theatre MTC . Reviewed by Jill Kyle-Keith. A simple roll of the dice sets the stage for “Jumanji” to spring to life for its world premiere from June 17 to Aug. 28 at Adventure Theatre-MTC (ATMTC) in Glen Echo Park. Adapted for the stage by a pair of playwrights–ATMTC ‘s Artistic Director Michael J. Bobbitt and Sandra B. Eskin, the play is based on the 1981 book of the same name by two-time Caldecott Medal-winning author Chris Van Allsburg. The impressive production team bringing the play to life features Serge Seiden, Mosaic Theater Company of DC’s managing director and producer, as director, and Elena Day, movement theater director, performer and teacher known as the creator of The Green Bird, Cirque du Soleil’s signature character, is assistant director. Five professional adult actors comprise the cast of the play, recommended for ages 4 and older. During their collaboration, Bobbitt and Eskin focused on the relationship between the story’s siblings, Judy and Peter, because “we had decided that the siblings don’t quite get along…one is a pre-teen, one is a teenager, and they are consumed with their life ambitions.” While their parents are at the opera, the children are bored and left to their own devices. They visit a nearby park and come upon an abandoned game called Jumanji and take it home. “They have to learn to work together in order to complete the game,” Bobbitt said. Bobbitt said the show would feature an “eclectic mix of puppeteers,” where an actor will always be present, but may be wearing part of the puppeteer costume. “We meet the mom and dad as they’re leaving, and then the mom and dad double as puppeteers for the other animals,” he noted. In 1995, “Jumanji “was made into a movie starring the late Robin Williams. Bobbitt noted that one of the “biggest hurdles is how do you take a brand that people have a specific memory of, especially the movie, and do a stage production that doesn’t let the audience down? How do you fulfill their expectations but not recreate the film?” To that end, he said the audience will enjoy a “4-D, or immersive experience” to feel what the characters are experiencing. A mist will come over the audience during the monsoon and “sub-woofers will provide a rumbling sound to the sound system when the lava appears.” Judy and Peter go on a “wild journey without leaving their home…so we will transform the inside of the characters’ house into a forest, a lava flow…we will join projections, puppets, sound, and atmospheric enhancements (mist! snow!) to portray these different worlds,” said Day. The guide is, Bobbitt said, “a bit of a bumbling idiot for lack of a better term, and every time he disappears and reappears, we’re transported to a different location…so we meet the tsetse fly in the desert, and we encounter the volcano in Antarctica…so the audience may get snowed on,” Bobbitt laughed.